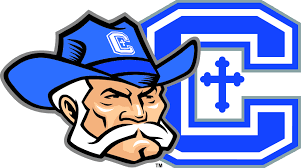 Covington Catholic High School (1925- ) is a private all-boy, nearly-all-White high school in Park Hills, Kentucky. It made the news across the US this week when a video showed its students on the steps of the Lincoln Memorial in Washington, DC on January 18th 2019 wearing MAGA hats and mocking a Native American elder, Ethan Phillips. 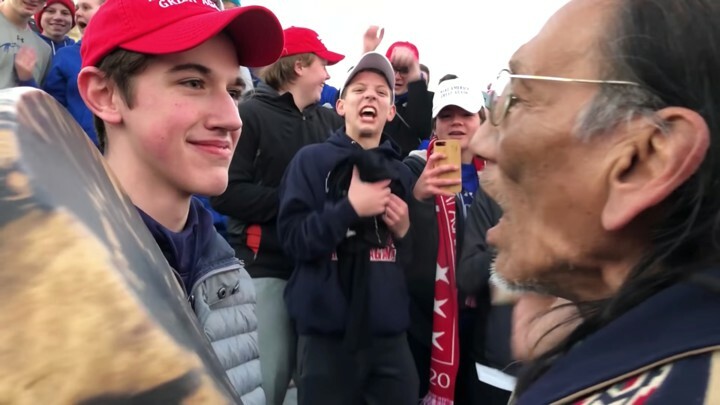 Nick Sandmann, pictured above, was one of the students. He was shown smirking at Phillips, staring him down, and standing in his way – or, in the Whitewashed gaslit version, smiling, being friendly, and “standing his ground” (strangely the same words George Zimmerman used to excuse killing Trayvon Martin). Size: 586 students, 40 teachers. Location: at 1600 Dixie Highway, Park Hills, Kentucky in Kenton County (outer-city Cincinnati). Fees: $9,150 to $9,950 a year. Demographics: All the teachers are White, nearly all students are too. Mascot: The Colonel (pictured above), who looks like a Confederate colonel, the kind who fought for slavery during the Civil War. Pat Cipollone (’84), Trump adviser, now the White House Counsel. Helped to convert Fox News opinion-maker Laura Ingraham to Catholicism. Kenton County is about as White (89%) and pro-Trump (59%) as, say, Idaho. Greater Cincinnati is 12% Black, Kenton is 4%, Covington is about 1%. Christian education: Many White parents send their children to private White schools to avoid mixed-race public ones. Catholic values: Covington sends students to the anti-abortion March for Life. That is why they were in Washington. It does not seem to send them to anti-racist marches – even though US Catholic bishops oppose racism for much the same reason as killing the unborn: the dignity and value of every human life. Thank the Southern Strategy for yoking abortion to racism – and therefore the ugly run-ins between the March for Life (1974- ) and the Indigenous Peoples March (2019- ) that Phillips was part of. But Black and Middle Eastern students seem to tell a different story. So does blackface at Covington basketball games (pictured above). So does their basketball players using Nazi hand signs. So does their mocking of Phillips. So does that look on Sandmann’s face. So does the MAGA hat that he and many other Covington students wore. MAGA hats are red baseball hats worn by supporters of Donald Trump, the openly racist US president. 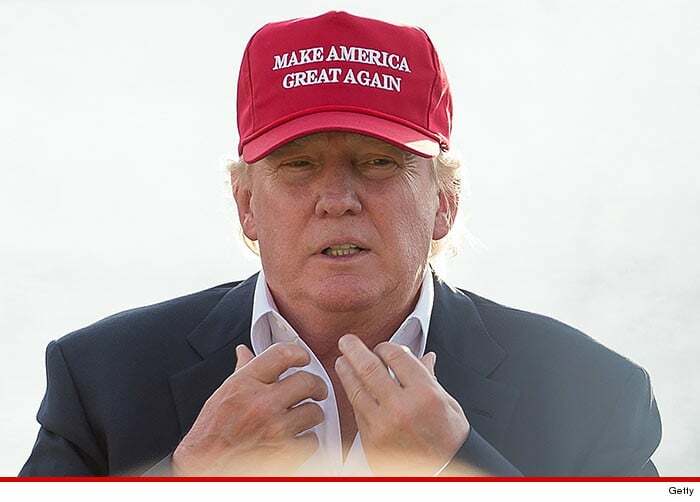 MAGA is short for “Make America Great Again”, the words on the hat. The “again” makes it racist, even apart from Trump: the US of yore was “great” only for White people. That seems to be a bridge too far for most White people because that would mean millions of them are, gasp, racist. So, as we saw this week, Whites, both left and right, try not to notice its racism. It becomes yet another piece of the racist wallpaper of North America that Whites grow blind to – and people of colour are just “imagining”. Update (February 21st): Although their bishop condemned their behaviour at first, the investigation he launched concluded that they did nothing offensive. Based partly on that, Sandmann’s parents are suing the Washington Post for $250 million for defamation of character, saying that the newspaper “bullied” Sandmann in its reporting “because he was the white, Catholic student wearing a red ‘Make America Great Again’ souvenir cap.” The Root, et al. At first, I was wondering if Covington Catholic High School was set up as a segregation academy. Its first graduating class was curiously in 1955. Park Hills, KY is a 97% white town. There is little need to set up all white schools just to avoid going to school with the demographics not part of “Make America Great Again”. But, I suppose that the school could get by more easily with blackface than a public school in the same district. Those kids, the teachers, their parents probably never actually encounter many blacks or Native Americans back home. For them, it is probably a game. White folks wearing their racism like some kinda pride. The stupid smirk on this kid’s face is his only way of cowardly owning up to his right to be racist. Being funny for his friends. Then being coached for a television appearance to live out his lie. The Wikipedia entry says the first graduating class was 1929. A larger building was constructed in the 1950s, and the class of 1955 was the first to graduate from that new location. It would be interesting to see how many blacks have been enrolled at that High School over the past years. The annual fee would eliminate many. Whatever the Catholic position is it is doubtful that a student was wearing black face if it had many blacks students. How much activities is religious at that school? I feel certain it is tax exempt. Notice they didn’t run up on those black Hebrew Israelites because they knew those black dudes would run through them like poop through a goose. So this MAGA wearing teenage gang turned their anger on the Native American man. So, can we safely conclude that it was not established as segregation academy as the public schools were probably already segregated back in 1929. Can we check to see if Kenton County schools were ever subject to mandatory desegregation during the desegregation era, or were there just too few black students in the school system to begin with that they did not bother. Their mascot, however, looks very much like a segregation academy icon. The smirks and jeers on the faces of those MAGA hat miscreants are the same as the old photographs of lynchings of black people. These people are monsters and these racist young thugs have been made to look like victims. The white boys were angry at the Black Hebrew Israelites because they couldn’t say and do what they wanted. The long story short these white kids are just another generation of racist. These MAGA hat wearing teen thugs are products of their racist parents. The Covington School should be called out for den of racial animus that it is these are very ignorant people. It must be nice to be able to hire a public relations firm to create a false image of this jerk teenager Nick Sandmann as some sweet little lamb. Wearing those MAGA hat are nothing but political gang regalia. Those boys knew what they were doing they are not victims. Too bad the families of Tamir Rice and Mike Brown and Rekia Boyd couldn’t have a public relation firm. Just about every little small POS in the middle nowhere town has this element not just America but all over the colonized world. I do have some quirks against Kentucky. It goes beyond Colonel Sanders and KFC to the backwoods assembly worker that failed to put antisieze on the engine mounting bolts of my van in Georgetown, Kentucky. This place is or was home to a hyper-nazi KKK group that that made headline news called the Imperial Knights. They had 2 members follow a native American youth and beat him up “Emitt Till” style some years back at a carnival. So much for the not being familiar with 1st nation people. Agreed. It would be interesting to know when the mascot was adopted. I suspect the school was originally founded as an alternative for Catholic kids at a time when the public school system tended to be highly Protestant in culture (school prayer still being allowed in the 1920s, etc.) and quite probably biased against Catholics. However, it is certainly interesting that the school outgrew its old building in the 1950s. You have to wonder if this was due to natural growth over time or to a sudden influx of Protestant whites due to desegregation of the public schools. I remember reading there was a time in America when Catholics were hated in this country. JFK was Roman Catholic so that must have been controversial during that time. The fact that these so called Christian schools are the antithesis of the teachings of Jesus Christ. But so are the Evangelicals that are Trump supporters. Some KKK/White Nationalists groups claim to be anti-Catholic. A couple weeks after the Synagogue Mass Shooting, the Loyal White Knights had a flier that featured “Satanic Catholics” as one of the groups not welcome to join. But the reality is probably a different story as Catholism is no longer an issue for most of the white Nationalist world. My parents moved from the South to a small town in the Midwest in the early 1960s. When they arrived, they were told that the main street separated the Protestant side of town and the Catholic side of town. There were two grocery stores, one on each side. My mom created a commotion because she did her shopping at both. She had grown up in the segregated South, but she said that she had never seen white people divide themselves up by religion like that. Also her brother had married a Catholic girl and had converted, and my cousins were being raised Catholic, and it was no big deal to anyone in my family. So my mom thought it was silly and shopped where she wanted and socialized with whom she wanted. Over the years, things have changed a lot, but there still is a divide to a degree and still some people in town who are very biased one way or the other. There are still neighboring towns that are either 95% Catholic or 95% Protestant. If you look back at the pilgrims and Puritans when they first arrived in ” New England” they wanted to escape from Catholism and the old World. This is probably where the first form of anti-Catholism arrived from. Anti- Irish sentiment stemmed from these beginnings as they Catholic. That would gradually change after the Second Klan Empire Wave. However, this region is almost entirely German American, with a little Swiss thrown in. Most of the families, whether Protestant or Catholic, immigrated in the mid to late 1800s. I believe they replicated the divisions between Catholics and Protestants that existed in their homeland, although of course once they arrived in the U.S., they also encountered that existing anti-Catholicism which had been present since the Puritan days. The immediate region is actually more heavily Catholic than Protestant in population, but the mainstream U.S. culture they found was predominantly Protestant and anti-Catholic. The juxtaposition resulted in some pretty strange power structures in my home area. He’s just practicing to become a supreme court justice on day. I’ve never seen someone wearing a MAGA hat in real life, as opposed to in a photo or video. Roughly a third of my state voted for Trump, but even his supporters don’t seem to walk around in those idiotic caps. I would wonder if a young man who wore one was going out of his way to be obnoxious and bother others. The blackface picture has similar implications. I think Covington Catholic needs to take a long, hard look at the kind of culture it’s promoting. Black face is not just horrific in the western hemisphere but because of the color variations of people on the Eastern hemisphere it burns a deep hole into the humanity of people. As a practicing Catholic I’m disappointed to see Catholic students coming out with such crap. The US bishops are going to disavow these nut jobs. That’s for sure! Trump invited the little bastards to the white house. Why? @Heru Sankofa: Because he thinks they are good people just like those Nazis in Charlottesville. They are part of his cult wearing their MAGA hats. And they will not be eating cheap hamburgers either. They will be dining on lobster and prime rib. This whole situation, especially the gaslighting racist version that spun events in favor of the “poor misunderstood children” of Covington reeks of the most vile aspects of white supremacy. And Ms. Milano and anyone else who equates the MAGA hats with white hoods? I agree wholeheartedly. The only difference is those MAGA hat wearers are so proud of their racism that they seem to be even more emboldened than the cowards behind the hoods. The hurt and angered BHI doesn’t help the situation with the words chosen. State actual sociological facts rather than theology if you want to get your point across. The Bible’s reference is even less than the Harry Potter universe of respectability and understanding of in today’s world. What are you talking about? On what planet did I make any reference to Theology, or the Bible? No idea where you’re going with your response but it has nothing to do with what I said. Read my comment again. Or don’t. My comment is all about my disgust with that group of kids and the people who are defending them. How about not tagging me if you’re responding to someone else or if you’re just spouting irrelevant nonsense? Oy. Kids wearing bodypaint to a blackout game is now racist… Even the kid on the right was most likely either wearing a jester face paint design or was trying to look like the comic book character Venom. Is James Harden using a “Nazi” hand symbol for using the same symbol? Is Stephen Curry also using a “Nazi” hand gesture? Is a white person using the 3 point gesture that NBA players use using a “Nazi” hand jesture? “MAGA hats are the new white hoods”-Melissa Milano(Actress) I totally agree with this statement. this is a hot mess, total cluster*, i refuse to go through the video, it’s just a shame but it shows how heated EVERYONE is now!!! You could ask Abagond to move your comment over here, or you could repost it here and ask him to erase the duplicate that got on the wrong thread. I cannot move comments. If i try to do it, it will look like my comment. Better to repost it and tell me to delete the original. I was referring to the offensive Hebrew Israelite spouting stuff at the maga students prior to the standard in the image.